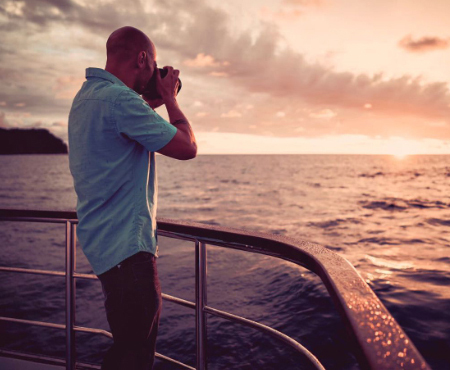 An international buffet perfectly paired with charming scenery for an unforgettable evening at sea. 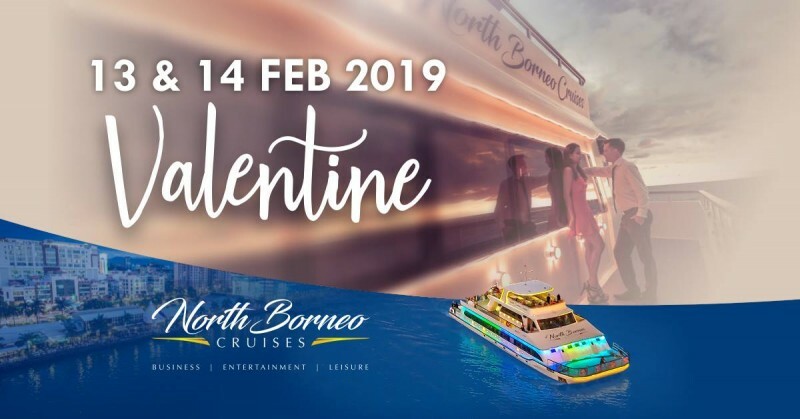 First of its kind in Sabah, the North Borneo Cruise takes you on a 2-hour scenic cruise past the islands of Tunku Abdul Rahman Marine park and down the central coast gliding along the city’s famous Waterfront. 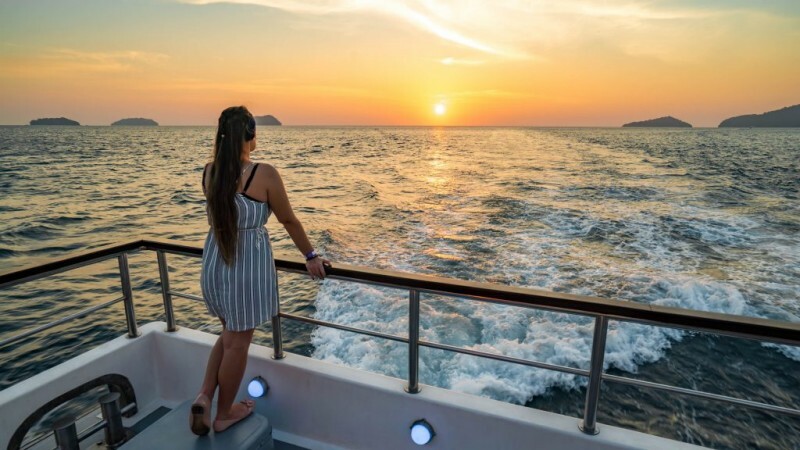 With two different sessions daily starting from the golden hours of sunset at 4:30pm to 7:00pm to when dusk paves way for city night lights at 7:30pm to 9:30pm, we cater to all crowd; from sunset chasers to night crawlers. 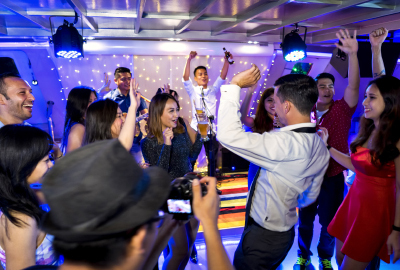 Let our team of dedicated specialist events planners will work with you to achieve the right environment for your event. 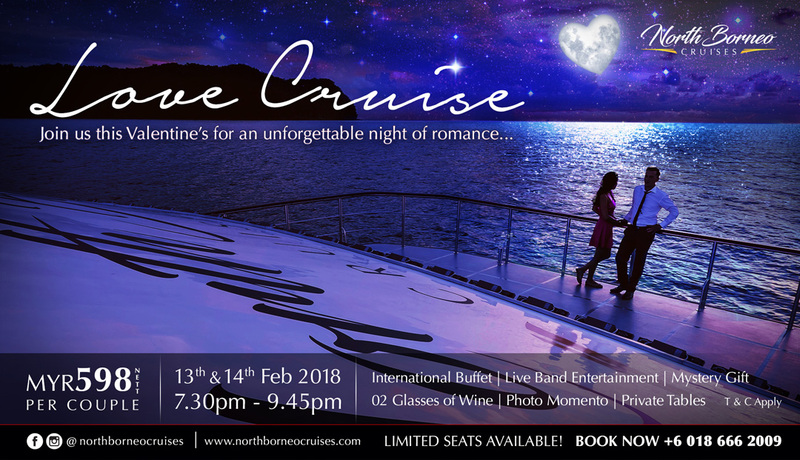 The most sought after culinary experience in North Borneo - All aboard Kota Kinabalu’s First and Only Dinner Cruise, taking you across the sultry South China Sea at its most beautiful during sunset or stunning city night lights seen from off the coast. Many thanks Ms. Nikki and staff for making it a splendid evening. Packed with good musicians, dance, nice food and very personal touch. Young kids too enjoyed the food and had loads of fun. The onboard hospitality was beyond expectation. The buffet was an amazing selection of dishes from choices of appetizers to desserts. The live band onboard were outstanding. All of these combined, the feeling was sensational inside the cruise. 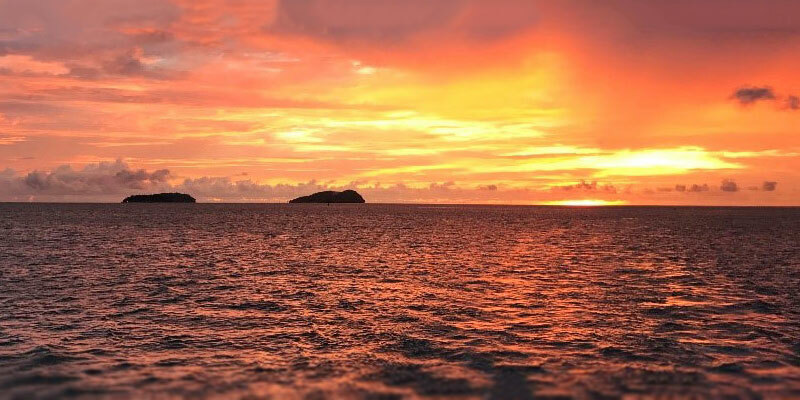 Then came the sunset, which was itself a beautiful experience viewed from top deck of the cruise. Eventhough a little bit hard on your wallet it was an amazing experience and would highly recommend this activity. We are on a company trip. I brought all my staffs for this Cruise and everyone enjoyed it to the fullest. The foods are prepared well. The music is nice. The staffs are friendly. The sunset is amazing. Everything is well done. 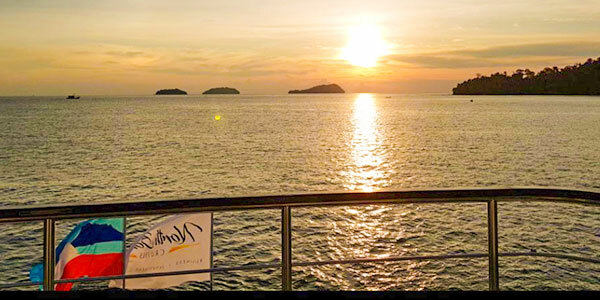 Thank you North Borneo Cruises for a fantastic memory. I would definitely recommend this tour for everyone. I will come again with my family soon. This tour would be my first choice for things to do in KK. 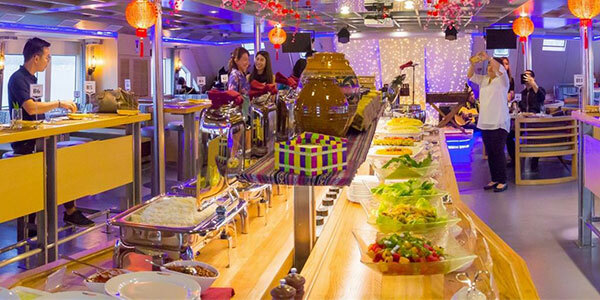 Food served onboard was excellent and replenished regularly. Nice ambience indoors with live band. 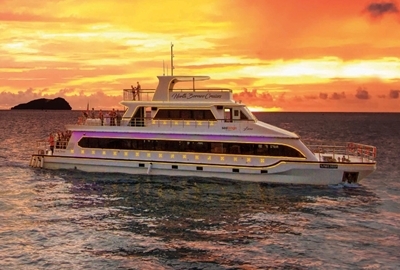 Guests are free to go top deck for fresh air and enjoy the sunsets. It was a marvellous moment with my family. Food was great, Mood was greater! Music, Dance, Laughter, and beautiful sunset made a harmony each other. 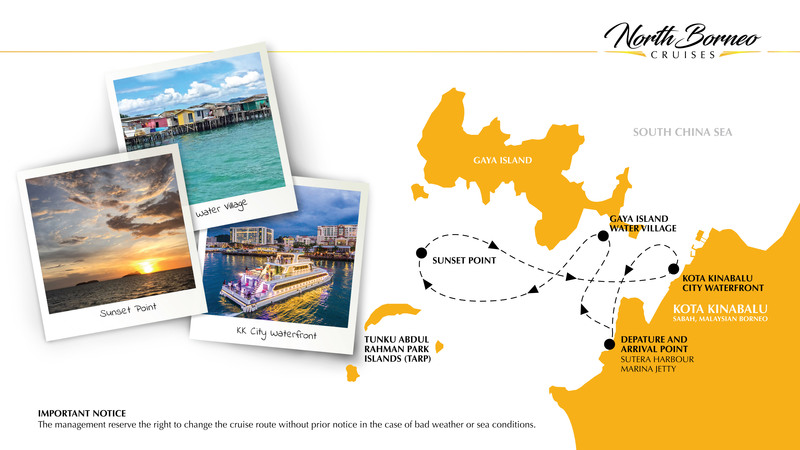 I definitely recommend this to anyone who visits Kota Kinabalu. A Must - Visit tour! 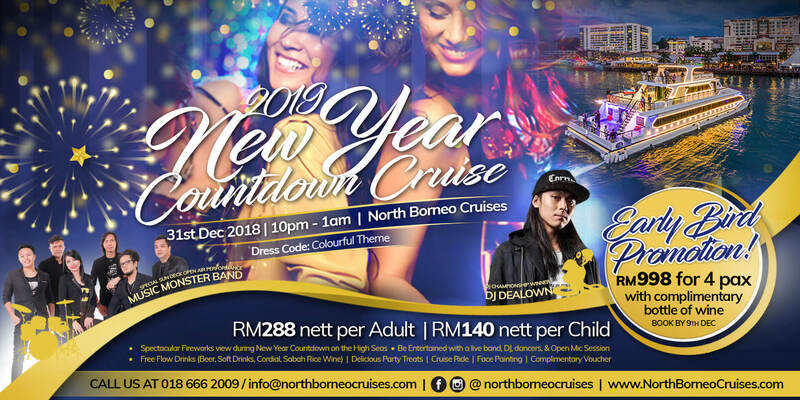 Get ready for the most anticipated 2019 New Year Countdown Party in Kota Kinabalu, Sabah! 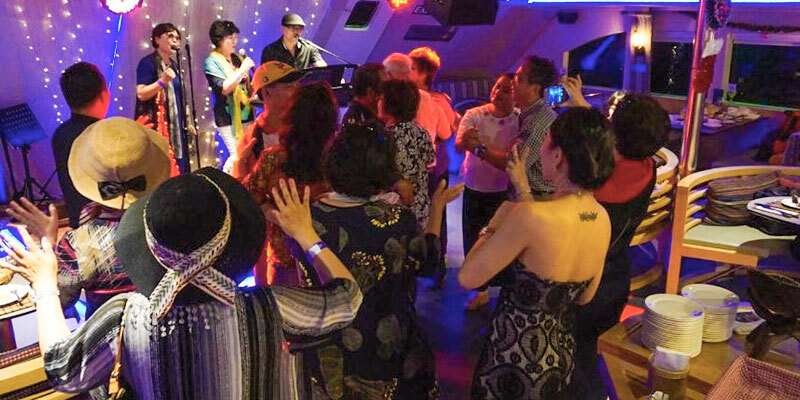 Come and join us onboard for our 2019 NEW YEAR COUNTDOWN CRUISE on the 31st December 2018, from 10pm - 1am. NBC VIP Room + Happy Hour Deals! 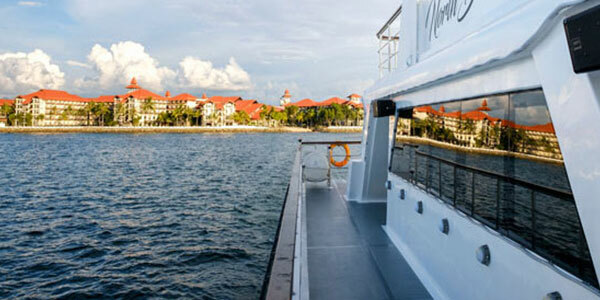 The North Borneo Cruises takes a very simple yet scenic route along the best of Kota Kinabalu’s coastal charms. 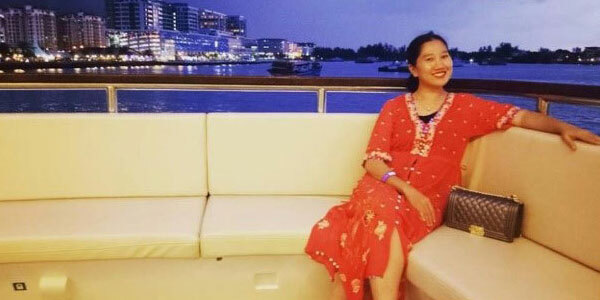 Cruising by the islands of Tunku Abdul Rahman, we will make a steady passing by the Gaya Island Water Village. We then carry on our way to a vantage sunset viewing point where we can witness the evening sun rays transition to night. It doesn’t end there! 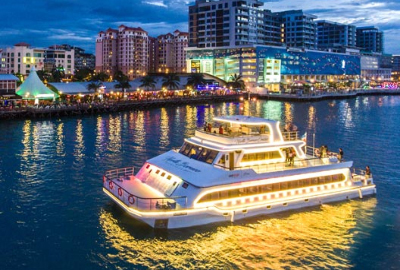 Watch our catamaran light up in technicolour and turn heads as we cruise along Kota Kinabalu’s waterfront before heading back to Marina Jetty. Leave us a message through the form below for general enquiries.